Most triathletes either hate or tolerate the swimming portion of the competition. That’s because most of them didn’t grow up swimming but everyone learned to ride a bike and knows how to run. Learning to swim with an efficient and effective stroke later in life isn’t impossible at all but doesn’t typically come easily without some level of coaching from someone who knows what to look for. Swimmers with a proper technique look like they are just gliding through the water effortlessly. Click here to download a document I put together with a handful of tips and tricks for frustrated or under-producing triathlete swimmers, including workout drills, equipment recommendations and race day suggestions. Maybe your child just joined a summer league swim team and it’s given you the itch to swim yourself. Or maybe you are a good runner and cyclist but your swimming skills are preventing you from trying a triathlon. 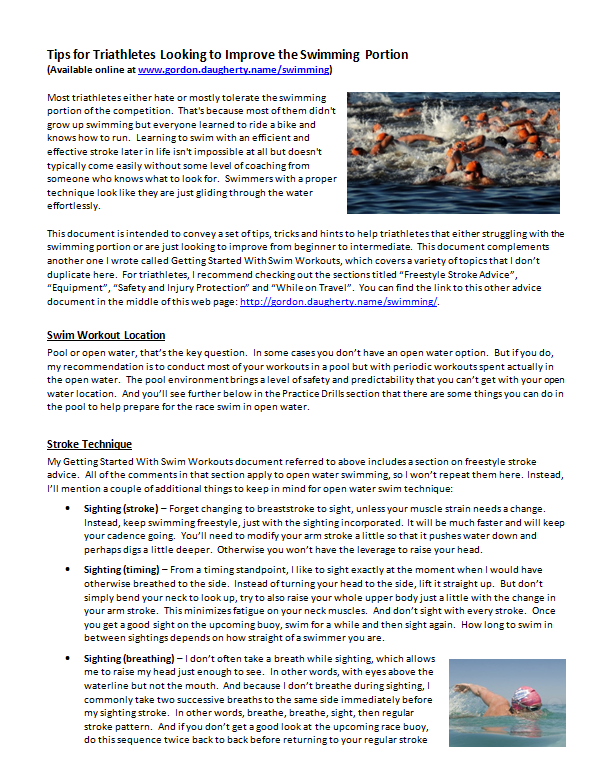 Whatever the case, I’ve created an advice document intended for adults that want to start swimming as a form of workout. The document includes advice for initially building up your stamina, sample workout sets, stroke advice, equipment recommendations, tips for avoiding injury and a website reference for finding good lap pools while on business travel. You can download the document here. And if you later end up getting really serious, check out the swim workouts for competitive swimmers on my Swimming page.